Mugs make great gifts and keepsake items for loved ones. Spread a little cheer and a good cup of Joe for any occasion! I made these particular mugs to ask my sister to be my Maid of Honor! We are huge Disney fans, and what better way to celebrate being sisters other than FROZEN?! 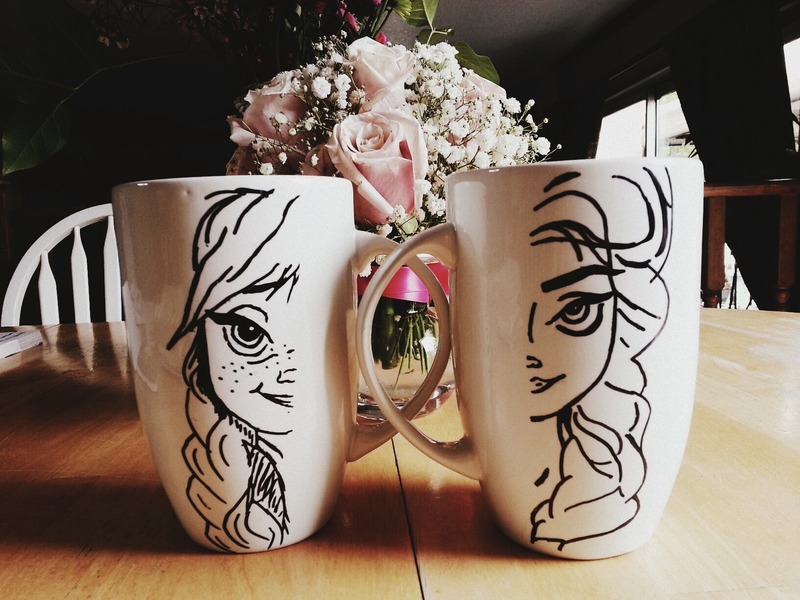 Here is a step by step process for our Anna and Elsa mugs, feel free to do your own designs as well. Lets get started! After you’ve picked out the perfect mug(s), you can chose to freehand a design, or be lazy like me, and trace! So once you’ve found your simple design or simplified characters to print (want image to be size of mugs), trace using thin lined paper with a pencil. Pull paper as snug to the surface as possible before taping the other side. The round mug would “crinkle” the paper at the bottom of the characters’ braids, some may have to be free-handed. Trace pencil with a sharpie. Make sure to move slow enough to stain through the paper, while making super fine lines. Sharpie will bleed onto the surface, so transfer may be thicker than desired. Remove taped paper gently, there will be a faint sketches of lines from your original tracing. Connect the faint lines to form the image or character! To keep the print on longer, bake mug(s)! We are going to place mugs in oven, bake at a low temp oven at 225 for 2 hours. Make sure to keep mugs in the oven, even while pre-heating and cooling. Putting mugs in oven, when already heated, may cause your mug to crack! Ooh! Tracing! Good idea. The mugs turned out beautifully! Looks amazing? just curious where did you get the image? Incredible, love it did u use oil based sharpies, could I ask you how long do the mugs last until they begin to fade? The mugs are still good as new! We’ve only hand washed them, and we keep them by our laptops. Can’t remember what Sharpie was in the photo, sorry Julie! We have only handwashed them. 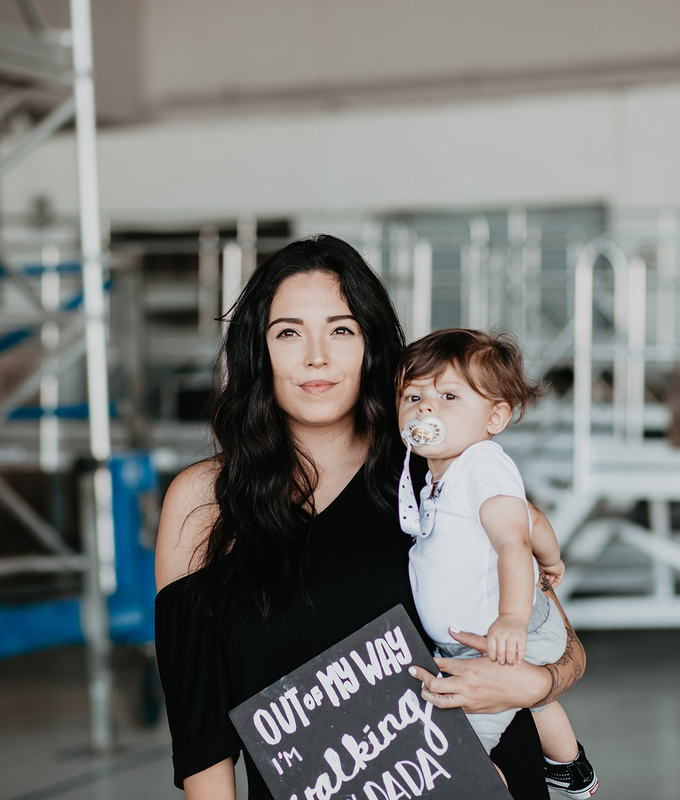 What did you search up on pinterest for the image? I tried multiple keywords but can’t seem to find it..or do you have the saved picture handy? Try searching Elsa and Anna drawing 🙂 I hope that helps! Did you bake the mugs on a cookie sheet or directly on the rack in the oven? Directly on the rack 🙂 Make sure to keep mugs in the oven, even while pre-heating and cooling. Putting mugs in oven, when already heated, may cause your mug to crack!